BetterEnhance is a free browser extension for those computer users who want to be abreast of the latest online deals. The application may seem to be attractive; however, in practice it is an obtrusive application because of its web banners, pop-up advertisements, in-line ads, coupons, and other advertisements. 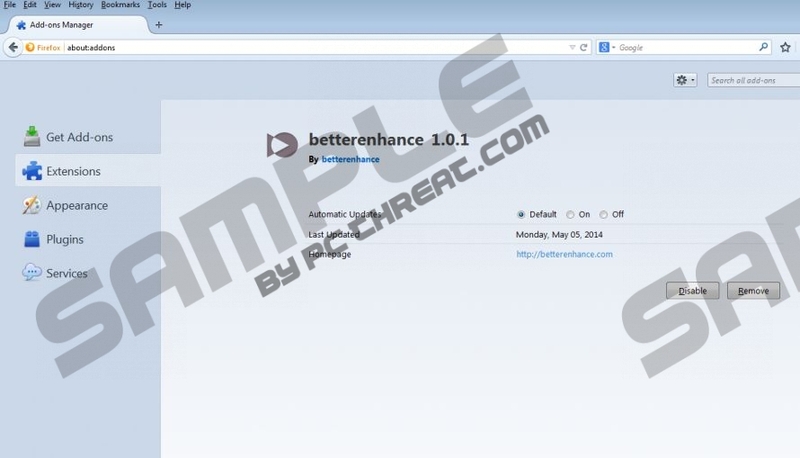 BetterEnhance is categorized as adware and is an addition to a group of adware programs developed by SuperWeb. The application is identical to WiseEnhance, RambleRoam, Blarble, Web Flipper, and many other applications. BetterEnhance is promoted at betterenhance.com, which is very similar to websites promoting RambleRoam and the other programs developed by SupperWeb. Chances are that BetterEnhance will be distributed by other free applications because some of SuperWeb programs have been discovered to be distributed along with media players, browser add-ons, and other desktop programs. As to the fact that the application can monitor you, it is important to note that the adware program records non-personally identifiable information, but in some cases personally identifiable information may also be recorded by the application. BetterEnhance records search terms, click, impressions, browsing history, your IP address, etc. If you do not want to risk exposing your personal information to the adware program, remove it from browsers as soon as you. During the installation process, Betternchance creates various registry entries and files. In order to have all the components of the adware deleted, you should implement a powerful spyware removal tool. You may manage to uninstall BetterEnhance with the help of our removal guide provided below but we recommend using SpyHunter. Not only can this program remove BetterEnhance, but also other programs, including rogue anti-virus programs, browser hijackers, Trojans, rootkits, etc. If you do care about your privacy and want to browse the Internet safely, implement the recommended application as soon as you can. Press the Windows key to access the Start screen. Click the Control Panel icon and then select Uninstall a program. Click Add or Remove Programs and uninstall BetterEnhance. After you have removed BetterEnchance, you should implement a reliable scanner. Click the button below to download a free scanner, which can easily detect numerous malicious programs, including the components of BetterEnchance. Quick & tested solution for BetterEnhance removal.